Organizations and businesses place their trust in the security industry to professionally safeguard the well-being of people, as well as property and other valuables. It is critical that security supervisors and their employees understand the importance of providing outstanding customer service as they interact on a daily basis with clients and the general public. The highly skilled team at P4 Security Solutions have diverse backgrounds in law enforcement, private security, military service and corporate training. Drawing upon our vast experience over many decades, we have created a unique customer service training program designed to meet the specific needs of security industry professionals. 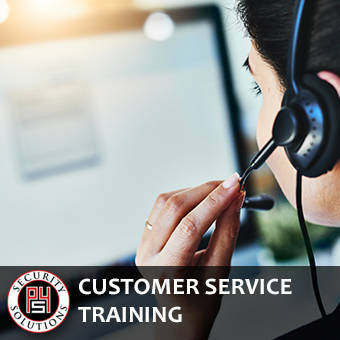 Our specialized customer service training program addresses the knowledge base and skill set needed to provide second to none, security staff customer service, despite the pressures sometimes associated with this dynamic industry. Through various methods, such as lectures, interactive dialogue and media presentations, our security professional customer service training program focuses on the following important elements. Defining the value of providing great customer service. Understanding the fundamental characteristics of customer service. Recognizing and acknowledging the customer’s perspective. Teaching the “Moment of Truth” concept in daily work duties. Strategies for dealing with difficult people & anger. The security industry today is very much a people business and the personnel performing these duties need to be equipped with the skills and knowledge they need to be successful. The experts at P4 Security Solutions can create extremely effective customer service training programs, tailor fit to each client’s unique needs and challenges. Contact us today to learn more about how we can put our decades of experience to work for you.